This recipe is a knock-off from a dish served at Bertucci's, an Italian restaurant in the northeast. 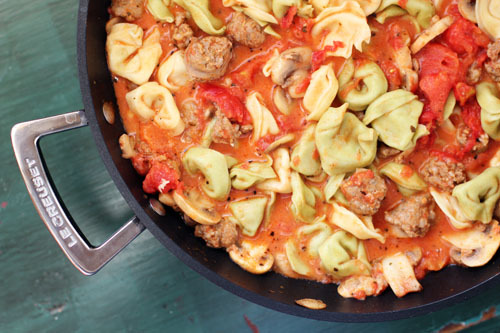 The tortellini is paired with mushrooms and Italian sausage in a light creamy tomato sauce. Heat a few swigs of olive oil in a large skillet over medium heat. 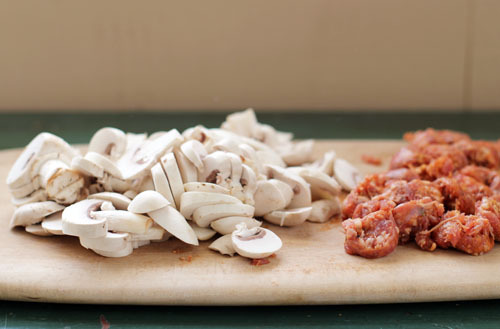 Add sausage and mushrooms and cook until both ingredients are cooked through. Add garlic to the pan and stir to distribute. Using your hands, break up the whole tomatoes into bite-sized pieces straight into the skillet, sort of mushing it all up. Add the ½ cup reserved juice, salt, pepper, sugar, basil (if using dried) and stir well. Let simmer for about 5 minutes. 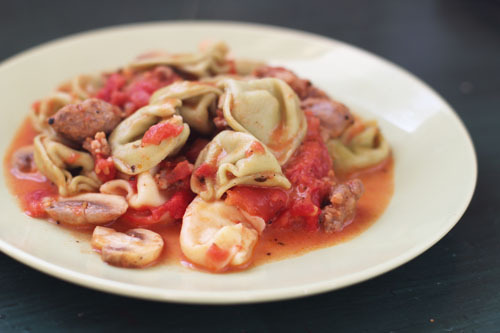 Cook tortellini according to package directions and drain. Add cream and basil (if using fresh) to tomato sauce-mushroom-sausage mixture. Stir to combine completely. 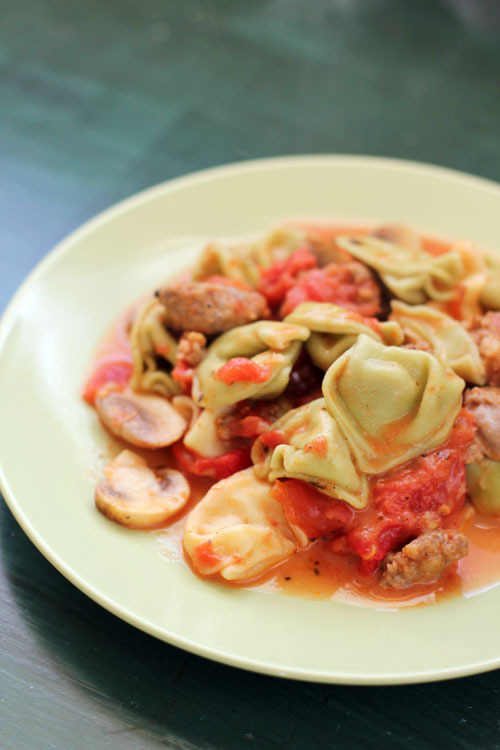 Pour sauce over tortellini, sprinkle with parmesan cheese and eat! Did one of you go to Tufts? I loved Davis Square! Nate went to Tufts! 🙂 We have many fond memories of Davis Square, especially from when we were first married. Great little spot! totally trying this next week! how delicious does this look? yum! 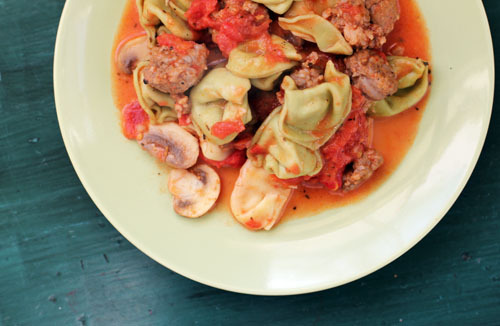 can’t wait to make this for dinner soon! What size of can of whole tomatoes? 2. its your X anniversary and you are taking this women out for a $12 chicken dinner ? A bit sad why not celebrate big if you can…. haha! it is funny how our perspective changes. Love, love, love Bertucci’s. It’s also a family favorite (we’re indoctrinating our three year old). We used to live in Davis, but moved seven years ago. Now our go-to location is Hingham.